I'm not sure if Tote Bag Tuesday is already a thing but if it isn't, I'm making it one. I happen to love a good tote bag any day of the week. They are handy to have around. I have some hooks in my hallway where I hang all sorts of tote bags for various purposes (see photos here) and I keep an assortment in my car for grocery and art supply shopping trips. I also use them to carry snacks and stuff out to the garden. Really, the possibilities are endless. 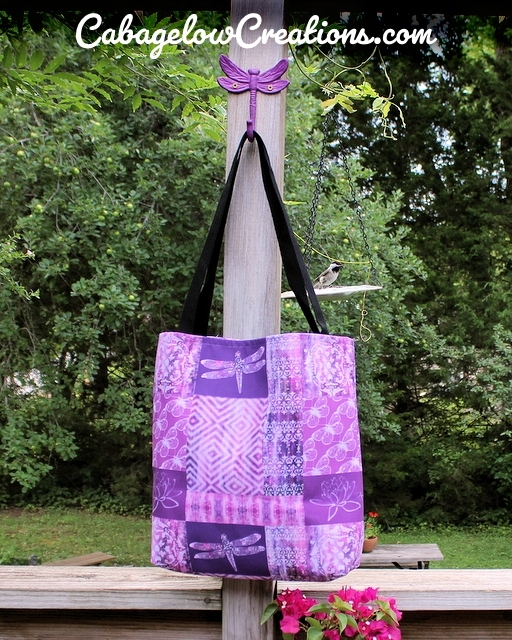 Today I thought I'd feature one of my newest tote bags: the Purple Patina Mosaic Tote Bag from my Cabagelow Creations Shop. This is one of the new all over print tote bags that Zazzle came out with not too long ago and I just love it. When I opened the package and saw it for the first time I was really impressed with how rich the color is. The material is good quality and it's a really nice size (16 x 16 and also available in 18 x 18). I am definitely proud to offer my designs on this product. If you like this tote bag, click here to check out more tote bags at The Cabagelow Creations Shop or you might also want to visit my Tote Bags For Hippies collection or my Tote Bags For Artists collection!